Chris’ greatest joys and achievements in life are being a husband and father. He’s been married to Kristina (a lovely Kingsport native) for over 20 years. He is also the father to two wonderful sons…Connor, who is attending college at Northeast State, and Cayden, the most energetic 1st grader at Rock Springs Elementary. He grew up, the son of missionaries, in Venezuela, Chile, Colombia, and Mexico. He also served in the United States Air Force in Oklahoma and spent a brief time in Saudi Arabia. Chris is passionate about leadership coaching, connecting churches and leaders, and being a missions catalyst locally and abroad. 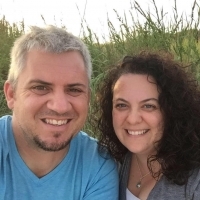 With 20 years of ministry experience, Chris brings diverse experience that includes youth ministry, church revitalization, church planting (Anglo & Hispanic), pastor, entrepreneur, and perhaps his favorite job of all time…barista. In his words, “I’m just an ordinary guy who is passionate about Jesus and His mission to the world.” Chris is always open to good conversation and coffee.